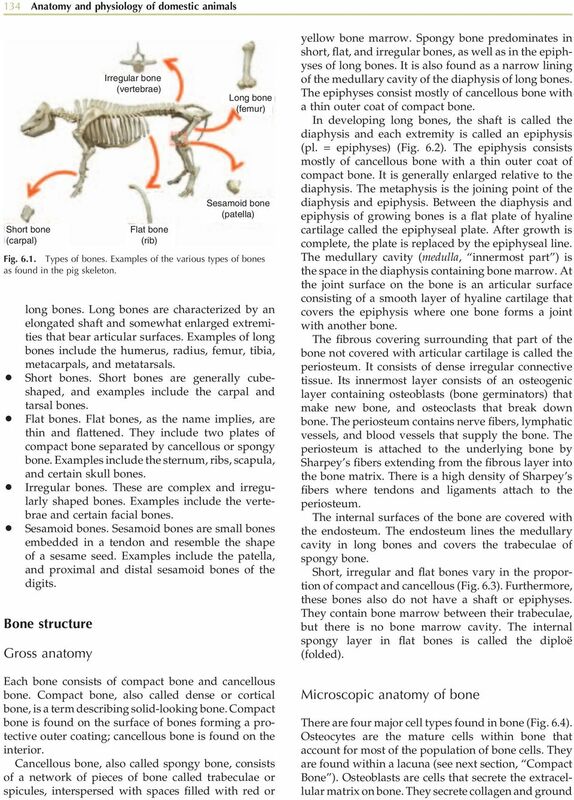 Download "Anatomy and Physiology of Domestic Animals"
6 136 Anatomy and physiology of domestic animals one another via connections containing gap junctions. As the matrix hardens, the osteoblasts become trapped within it, thus forming the lacunae and canaliculi. The osteoblasts become osteocytes, or mature bone cells. Osteocytes, the spider-shaped mature bone cells, are found in lacunae, the small cavities at the junctions of the lamellae. 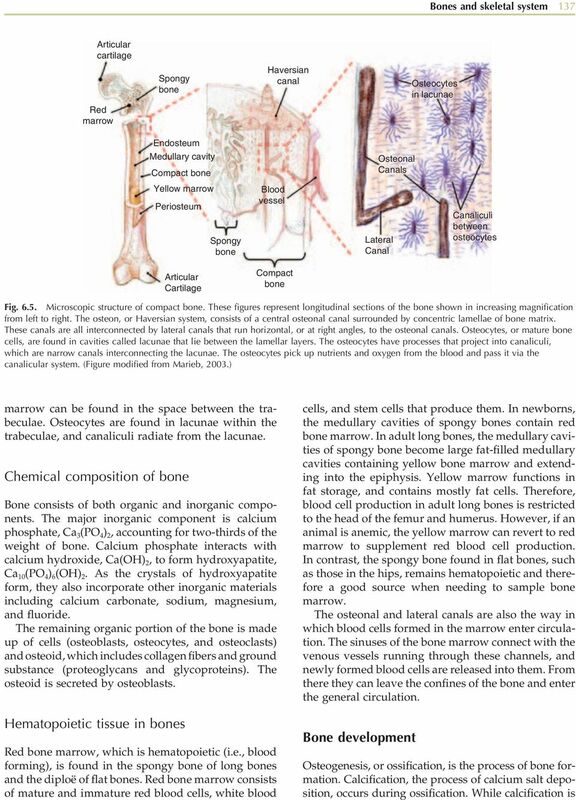 Only one osteocyte is found per lacunae, Compact bone Spongy bone (diploë) Compact bone Fig Internal anatomy of flat bone. Flat bones consist of an outer layer of compact bone that sandwiches an inner layer of spongy, or trabecular, bone (diploë). and these cells cannot divide. Numerous processes extend from each osteocyte into little tunnels running through the mineralized matrix called canaliculi, which connect adjacent lacunae. Therefore, there is a continuous network of canaliculi and lacunae containing osteocytes and their processes running throughout the mineralized bone. Canaliculi are important because they provide a route by which processes from one osteocyte can contact those of adjacent osteocytes. Therefore, via the canalicular system, all osteocytes are potentially in communication with one another. They pass information, nutrients, and/or wastes from one place to another. Osteocytes can synthesize or absorb bone matrix. If the osteocyte dies, bone matrix resorption occurs due to osteoclast activity, which is later followed by repair or remodeling by osteoblast activity. While mature compact bone has a lamellar structure in which the fibers run parallel, immature bone, also called woven bone, has a nonlamellar structure. Woven bone is put down rapidly during growth or repair, and its fibers are aligned at random resulting in lower strength. Woven bone is generally replaced by lamellar bone as growth continues. 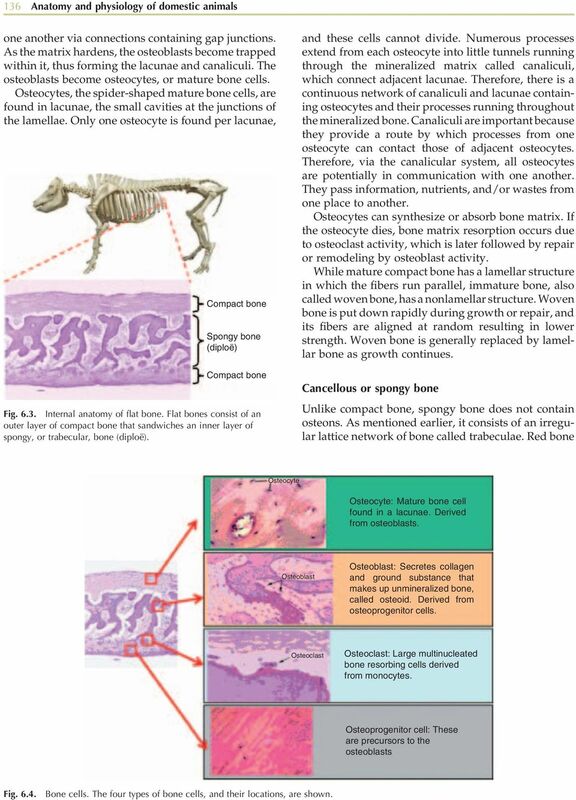 Cancellous or spongy bone Unlike compact bone, spongy bone does not contain osteons. As mentioned earlier, it consists of an irregular lattice network of bone called trabeculae. Red bone Osteocyte Osteocyte: Mature bone cell found in a lacunae. Derived from osteoblasts. Osteoblast Osteoblast: Secretes collagen and ground substance that makes up unmineralized bone, called osteoid. Derived from osteoprogenitor cells. Osteoclast Osteoclast: Large multinucleated bone resorbing cells derived from monocytes. Osteoprogenitor cell: These are precursors to the osteoblasts Fig Bone cells. The four types of bone cells, and their locations, are shown. 9 Bones and skeletal system 139 Hyaline cartilage Step 1: Step 2: A hyaline cartilage model is produced by chondrocytes. 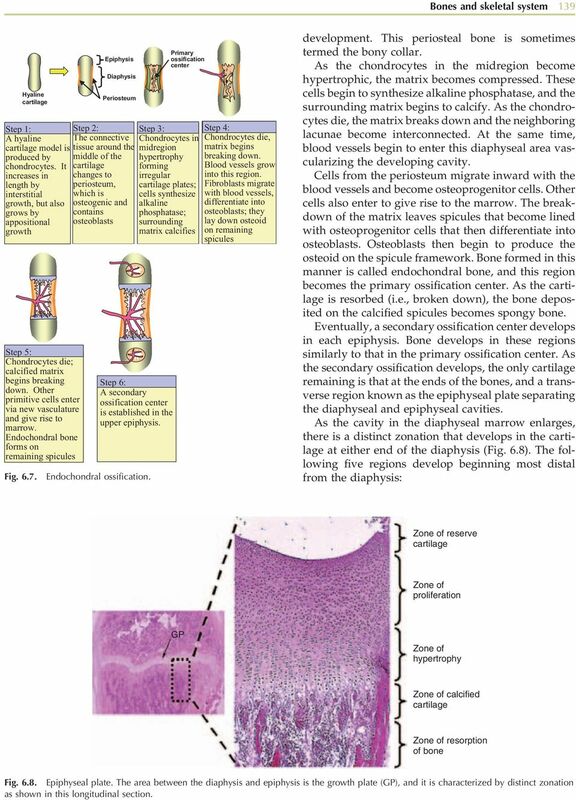 It increases in length by interstitial growth, but also grows by appositional growth Step 5: Chondrocytes die; calcified matrix begins breaking down. Other primitive cells enter via new vasculature and give rise to marrow. Endochondral bone forms on remaining spicules Epiphysis Diaphysis Periosteum The connective tissue around the middle of the cartilage changes to periosteum, which is osteogenic and contains osteoblasts Primary ossification center Step 3: Chondrocytes in midregion hypertrophy forming irregular cartilage plates; cells synthesize alkaline phosphatase; surrounding matrix calcifies Step 6: A secondary ossification center is established in the upper epiphysis. 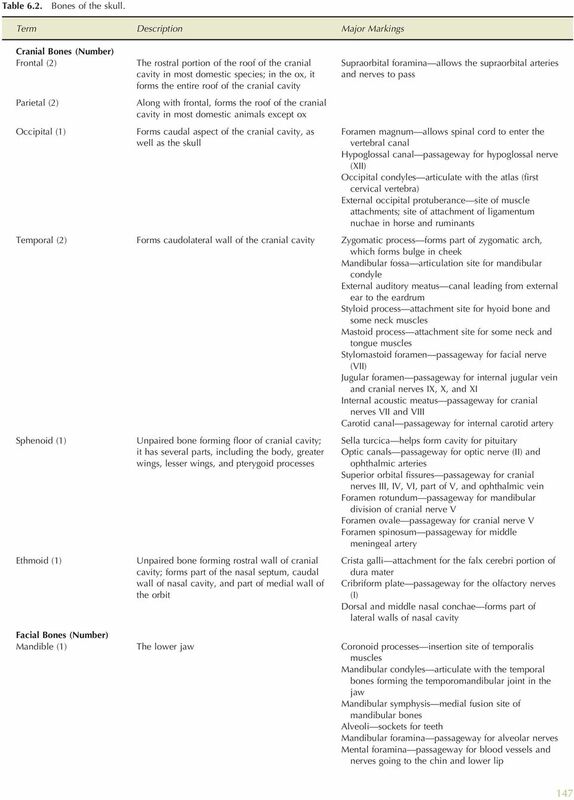 Fig Endochondral ossification. Step 4: Chondrocytes die, matrix begins breaking down. Blood vessels grow into this region. Fibroblasts migrate with blood vessels, differentiate into osteoblasts; they lay down osteoid on remaining spicules development. This periosteal bone is sometimes termed the bony collar. As the chondrocytes in the midregion become hypertrophic, the matrix becomes compressed. These cells begin to synthesize alkaline phosphatase, and the surrounding matrix begins to calcify. As the chondrocytes die, the matrix breaks down and the neighboring lacunae become interconnected. At the same time, blood vessels begin to enter this diaphyseal area vascularizing the developing cavity. Cells from the periosteum migrate inward with the blood vessels and become osteoprogenitor cells. Other cells also enter to give rise to the marrow. The breakdown of the matrix leaves spicules that become lined with osteoprogenitor cells that then differentiate into osteoblasts. Osteoblasts then begin to produce the osteoid on the spicule framework. Bone formed in this manner is called endochondral bone, and this region becomes the primary ossification center. As the cartilage is resorbed (i.e., broken down), the bone deposited on the calcified spicules becomes spongy bone. Eventually, a secondary ossification center develops in each epiphysis. Bone develops in these regions similarly to that in the primary ossification center. As the secondary ossification develops, the only cartilage remaining is that at the ends of the bones, and a transverse region known as the epiphyseal plate separating the diaphyseal and epiphyseal cavities. As the cavity in the diaphyseal marrow enlarges, there is a distinct zonation that develops in the cartilage at either end of the diaphysis (Fig. 6.8). The following five regions develop beginning most distal from the diaphysis: Zone of reserve cartilage Zone of proliferation GP Zone of hypertrophy Zone of calcified cartilage Zone of resorption of bone Fig Epiphyseal plate. The area between the diaphysis and epiphysis is the growth plate (GP), and it is characterized by distinct zonation as shown in this longitudinal section. 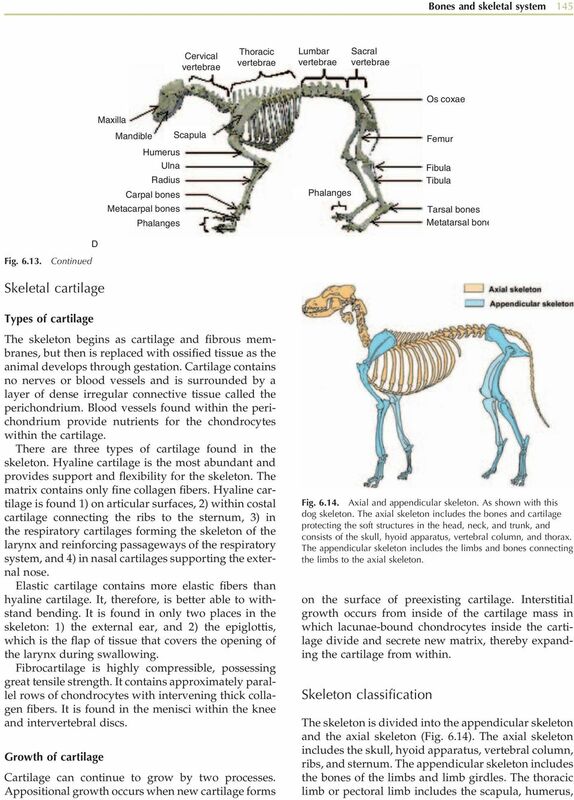 10 140 Anatomy and physiology of domestic animals 1. 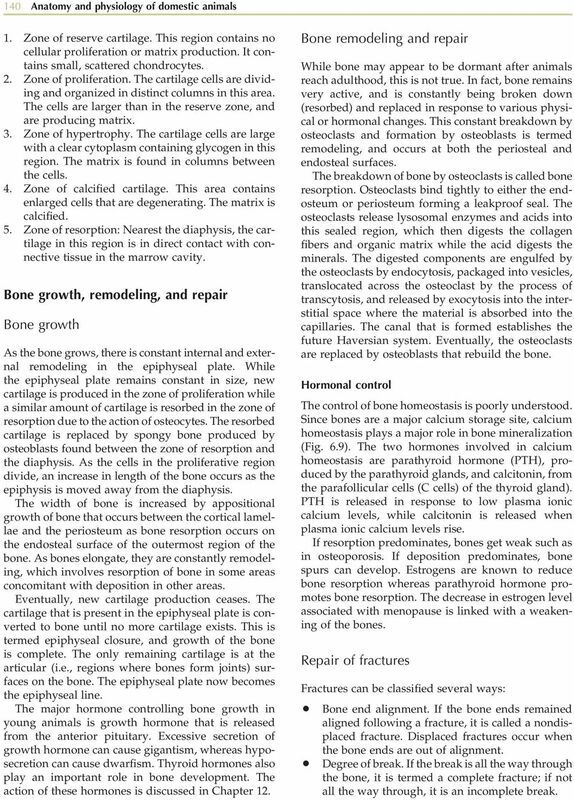 Zone of reserve cartilage. This region contains no cellular proliferation or matrix production. It contains small, scattered chondrocytes. 2. Zone of proliferation. The cartilage cells are dividing and organized in distinct columns in this area. The cells are larger than in the reserve zone, and are producing matrix. 3. Zone of hypertrophy. The cartilage cells are large with a clear cytoplasm containing glycogen in this region. The matrix is found in columns between the cells. 4. Zone of calcified cartilage. This area contains enlarged cells that are degenerating. The matrix is calcified. 5. Zone of resorption: Nearest the diaphysis, the cartilage in this region is in direct contact with connective tissue in the marrow cavity. Bone growth, remodeling, and repair Bone growth As the bone grows, there is constant internal and external remodeling in the epiphyseal plate. While the epiphyseal plate remains constant in size, new cartilage is produced in the zone of proliferation while a similar amount of cartilage is resorbed in the zone of resorption due to the action of osteocytes. The resorbed cartilage is replaced by spongy bone produced by osteoblasts found between the zone of resorption and the diaphysis. As the cells in the proliferative region divide, an increase in length of the bone occurs as the epiphysis is moved away from the diaphysis. The width of bone is increased by appositional growth of bone that occurs between the cortical lamellae and the periosteum as bone resorption occurs on the endosteal surface of the outermost region of the bone. As bones elongate, they are constantly remodeling, which involves resorption of bone in some areas concomitant with deposition in other areas. Eventually, new cartilage production ceases. The cartilage that is present in the epiphyseal plate is converted to bone until no more cartilage exists. This is termed epiphyseal closure, and growth of the bone is complete. The only remaining cartilage is at the articular (i.e., regions where bones form joints) surfaces on the bone. The epiphyseal plate now becomes the epiphyseal line. The major hormone controlling bone growth in young animals is growth hormone that is released from the anterior pituitary. Excessive secretion of growth hormone can cause gigantism, whereas hyposecretion can cause dwarfism. Thyroid hormones also play an important role in bone development. The action of these hormones is discussed in Chapter 12. Bone remodeling and repair While bone may appear to be dormant after animals reach adulthood, this is not true. In fact, bone remains very active, and is constantly being broken down (resorbed) and replaced in response to various physical or hormonal changes. This constant breakdown by osteoclasts and formation by osteoblasts is termed remodeling, and occurs at both the periosteal and endosteal surfaces. 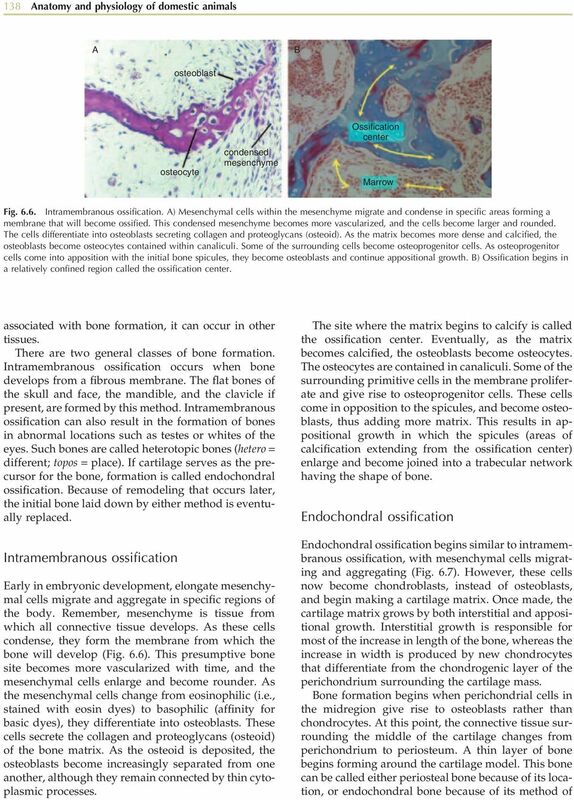 The breakdown of bone by osteoclasts is called bone resorption. Osteoclasts bind tightly to either the endosteum or periosteum forming a leakproof seal. The osteoclasts release lysosomal enzymes and acids into this sealed region, which then digests the collagen fibers and organic matrix while the acid digests the minerals. The digested components are engulfed by the osteoclasts by endocytosis, packaged into vesicles, translocated across the osteoclast by the process of transcytosis, and released by exocytosis into the interstitial space where the material is absorbed into the capillaries. The canal that is formed establishes the future Haversian system. Eventually, the osteoclasts are replaced by osteoblasts that rebuild the bone. 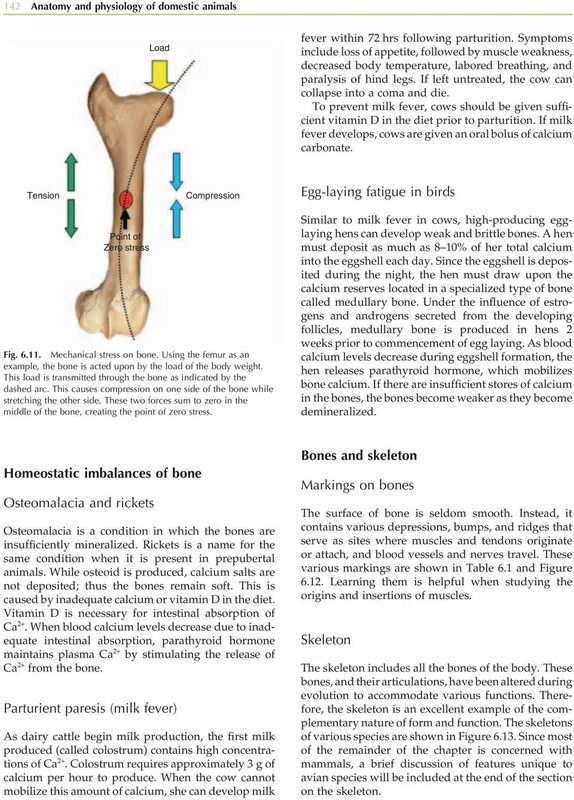 Hormonal control The control of bone homeostasis is poorly understood. Since bones are a major calcium storage site, calcium homeostasis plays a major role in bone mineralization (Fig. 6.9). The two hormones involved in calcium homeostasis are parathyroid hormone (PTH), produced by the parathyroid glands, and calcitonin, from the parafollicular cells (C cells) of the thyroid gland). PTH is released in response to low plasma ionic calcium levels, while calcitonin is released when plasma ionic calcium levels rise. If resorption predominates, bones get weak such as in osteoporosis. If deposition predominates, bone spurs can develop. Estrogens are known to reduce bone resorption whereas parathyroid hormone promotes bone resorption. The decrease in estrogen level associated with menopause is linked with a weakening of the bones. Repair of fractures Fractures can be classified several ways: Bone end alignment. If the bone ends remained aligned following a fracture, it is called a nondisplaced fracture. Displaced fractures occur when the bone ends are out of alignment. Degree of break. If the break is all the way through the bone, it is termed a complete fracture; if not all the way through, it is an incomplete break. 11 Bones and skeletal system 141 Calcitonin release Thyroid Gland Calcium deposition in bone Plasma Ionized Calcium 1. Hematoma formation 2. Fibrocartilaginous callus fromation 3. Bony callus formation 4. Bone remodeling Osteoclasts resorb bone Parathyroid Gland Fig Steps in fracture repair. PTH Fig Hormonal control of plasma ionic calcium concentration. An increase in plasma ionic calcium concentration results in the release of calcitonin from the thyroid gland. Calcitonin stimulates calcium deposition in bone. In contrast, a decrease in plasma ionic calcium concentration stimulates the release of parathyroid hormone (PTH) from the parathyroid glands, which promotes osteoclast activity resulting in an increase in plasma ionic calcium levels. Orientation of the break. If the break is parallel to the long axis, it is a linear fracture; if it is perpendicular to the long axis, it is a transverse fracture. Skin penetration. If bone protrudes through the skin, it is an open, or compound, fracture. A nonprotruding break is called a closed, or simple fracture. The repair process for a fractured bone involves four steps (Fig. 6.10): 1. Hematoma formation. As a result of a fracture, the blood vessels tear causing the formation of a hematoma, a mass of clotted blood, at the fracture site. Bone cells begin to die and the site shows the classic signs of inflammation, i.e., pain, swelling, redness, and loss of function. 2. Fibrocartilaginous callus formation. Capillaries grow into the hematoma from which phagocytic cells invade and remove the debris. Fibroblasts and osteoblasts migrate into the fractured area from the periosteum and endosteum. The fibroblasts form collagen fibers, which serve to span the space in the break, thus connecting the two ends. As the fibroblasts differentiate into chondroblasts, they secrete cartilage matrix. Finally, osteoblasts close to the capillaries begin forming spongy bone; those found further away, secrete a bulging cartilaginous matrix. This entire mass, called a fibrocartilaginous callus, spans the fractured area. 3. Bony callus formation. Bone trabeculae begin to appear as a result of the actions of the osteoblasts converting the fibrocartilaginous callus into a bony callus made of spongy (or woven) bone. Bony callus formation continues until the two ends of the bone are firmly attached. 4. Bone remodeling. Remodeling begins during bony callus formation and continues until the bony callus is remodeled. The excess material is removed from both the periosteal and endosteal area, and compact bone is formed along the shaft. Response to mechanical stress Although bone deposition occurs in response to a bone injury, it can also occur when additional strength is needed. This can occur in response to new physical pressures placed on the bone as would occur if the bone is bearing weight at a different angle. Wolff s law states that a bone grows or remodels in response to forces placed on the bone. Such forces include weight bearing on the bone or muscles pulling on the bone. Since such forces are generally off-center, they tend to bend the bone. In response, the compact bone thickens on one side while thinning on the other side through the remodeling process. Spongy bone forms in the middle since mechanical forces acting on the bone sum to zero in this region (Fig. 6.11). Nutrients necessary for bone deposition Bone deposition requires vitamin C for collagen synthesis, vitamin D for calcium absorption in the gut, and vitamin A for bone deposition and removal, in addition to calcium, phosphorus, magnesium, and manganese. 12 142 Anatomy and physiology of domestic animals Load fever within 72 hrs following parturition. Symptoms include loss of appetite, followed by muscle weakness, decreased body temperature, labored breathing, and paralysis of hind legs. If left untreated, the cow can collapse into a coma and die. To prevent milk fever, cows should be given sufficient vitamin D in the diet prior to parturition. If milk fever develops, cows are given an oral bolus of calcium carbonate. Tension Compression Egg-laying fatigue in birds Point of Zero stress Fig Mechanical stress on bone. Using the femur as an example, the bone is acted upon by the load of the body weight. This load is transmitted through the bone as indicated by the dashed arc. This causes compression on one side of the bone while stretching the other side. These two forces sum to zero in the middle of the bone, creating the point of zero stress. Similar to milk fever in cows, high-producing egglaying hens can develop weak and brittle bones. A hen must deposit as much as 8 10% of her total calcium into the eggshell each day. 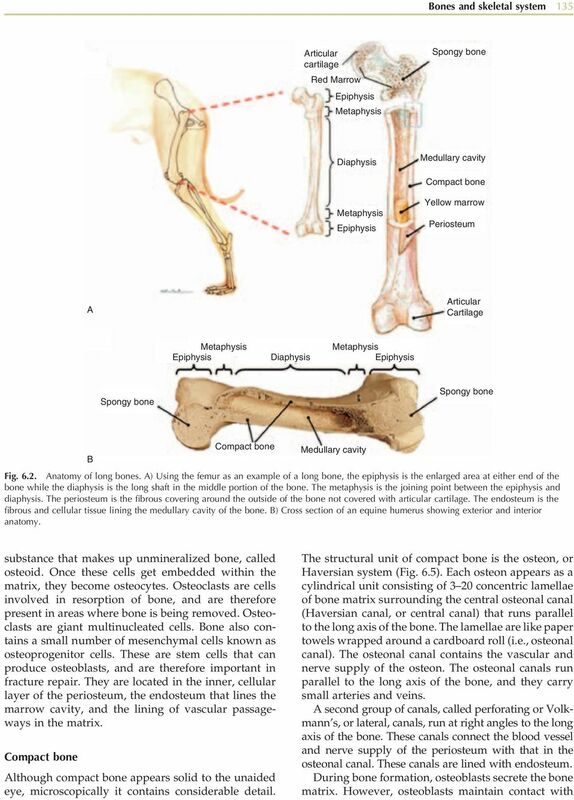 Since the eggshell is deposited during the night, the hen must draw upon the calcium reserves located in a specialized type of bone called medullary bone. Under the influence of estrogens and androgens secreted from the developing follicles, medullary bone is produced in hens 2 weeks prior to commencement of egg laying. As blood calcium levels decrease during eggshell formation, the hen releases parathyroid hormone, which mobilizes bone calcium. If there are insufficient stores of calcium in the bones, the bones become weaker as they become demineralized. Homeostatic imbalances of bone Osteomalacia and rickets Osteomalacia is a condition in which the bones are insufficiently mineralized. Rickets is a name for the same condition when it is present in prepubertal animals. While osteoid is produced, calcium salts are not deposited; thus the bones remain soft. This is caused by inadequate calcium or vitamin D in the diet. Vitamin D is necessary for intestinal absorption of Ca 2+. When blood calcium levels decrease due to inadequate intestinal absorption, parathyroid hormone maintains plasma Ca 2+ by stimulating the release of Ca 2+ from the bone. Parturient paresis (milk fever) As dairy cattle begin milk production, the first milk produced (called colostrum) contains high concentrations of Ca 2+. Colostrum requires approximately 3 g of calcium per hour to produce. When the cow cannot mobilize this amount of calcium, she can develop milk Bones and skeleton Markings on bones The surface of bone is seldom smooth. Instead, it contains various depressions, bumps, and ridges that serve as sites where muscles and tendons originate or attach, and blood vessels and nerves travel. These various markings are shown in Table 6.1 and Figure Learning them is helpful when studying the origins and insertions of muscles. Skeleton The skeleton includes all the bones of the body. These bones, and their articulations, have been altered during evolution to accommodate various functions. Therefore, the skeleton is an excellent example of the complementary nature of form and function. 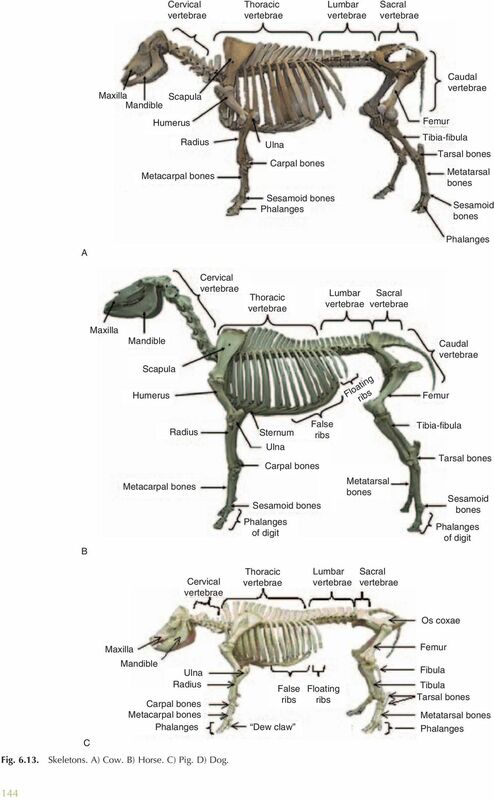 The skeletons of various species are shown in Figure Since most of the remainder of the chapter is concerned with mammals, a brief discussion of features unique to avian species will be included at the end of the section on the skeleton. 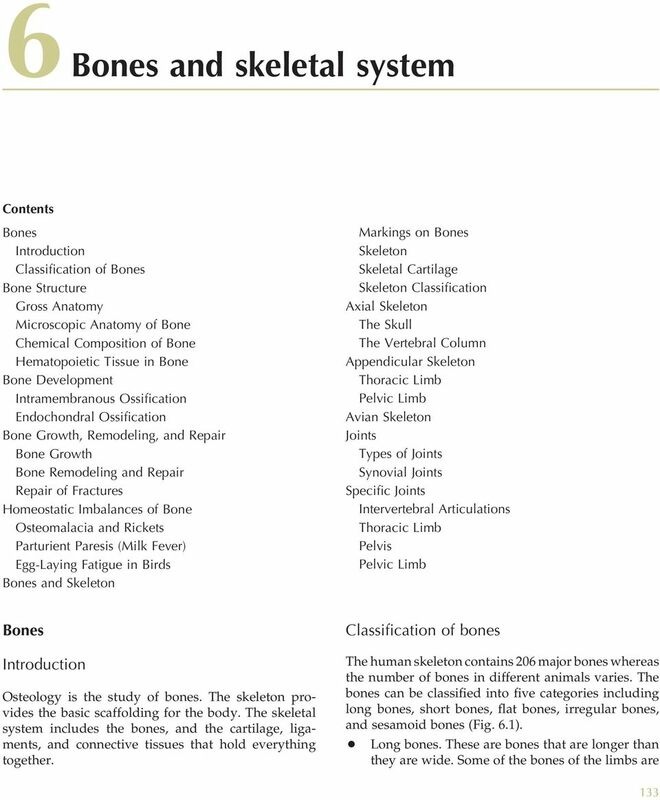 13 Bones and skeletal system 143 Table 6.1. Bone markings. Term Description Example Projections Where Muscles and Ligaments Attach Crest Narrow ridge of bone; usually prominent Iliac crest Epicondyle Raised area on or above a condyle Lateral epicondyle of the humerus Fossa Shallow depression, often serving as an articular surface Olecranon and radial fossae of the humerus Line Narrow ridge of bone; less prominent than a crest Gluteal line on wing of ilium Process Generally any bony prominence; sometimes used to name specific prominences Crest, spine, trochanter, tubercle, tuberosity, etc. ; olecranon process Ramus Armlike bar of bone Ramus of the mandible Spine Sharp, slender, often pointed projection Spine of the scapula Tuberosity Large rounded projection Deltoid tuberosity of the humerus Trochanter Very large, blunt, irregular-shaped process; found only on the femur Trochanter of the femur Tubercle Small rounded projection or process Greater tubercle of the humerus Projections That Help Form Joints Condyle Rounded articular projection Occipital condyle of the skull Cotyloid A deep articular depression Acetabulum of the hip joint Facet Smooth, nearly flat articular surface Superior costal facet of the vertebrae Head Bony expansion carried on a narrow neck Head of the femur Trochlea A pulley-shaped, articular structure Trochlea of the femur Depressions and Openings Allowing Blood Vessels and Nerves to Pass Fissure Narrow, slitlike opening Palatine fissure Foramen Round or oval opening through a bone Foramen magnum Fovea A shallow, nonarticular depression Fovea capitis on the head of the femur Incisure A notch-shaped depression at the edge of a bone Semilunar notch of the ulna Meatus Canal-like passageway External auditory meatus Sinus Cavity within a bone, filled with air and lined with mucous membrane Nasal sinuses Sulcus Furrowlike groove Brachial groove of the humerus A B C Trochanter Head Fovea Groove Tubercle Notch Tuberosity Condyle Epicondyle Fossa Trochlea Spine Fig Marking on bones. Various bovine bones are shown, including the femur (A), humerus (B), radius-ulna (C), and scapula (D), which are labeled to illustrate bone markings. D Functions of the skeletal system The skeleton has five primary functions: 1. Support. The skeletal system provides the structure to which the bones attach, as well as the structural support for the entire body. 2. Storage of minerals and lipids. The bones provide a major storage for various minerals, particularly calcium. In addition, the bones contain a substantial amount of lipid. 3. Blood cell production. The bone marrow is a site of formation for all types of blood cells. 4. Protection. The vital organs of the body are protected by the skeletal system. The ribs surround the visceral organs, whereas the central nervous system is encased within the skull and spinal cord. 5. Leverage. Many of the joints of the body act as levers therefore assisting with movement. 16 146 Anatomy and physiology of domestic animals radius, ulna, carpal bones, metacarpal bones, phalanges, and their sesamoid bones. The thoracic girdle or shoulder girdle includes the two scapulae, and the clavicle in man, which holds the shoulder laterally, but which is only vestigial in domestic animals. Axial skeleton The skull The skull is a very complex structure made mostly of flat bones. Except for the mandible that is attached via a movable joint, the bones of the skull are connected by interlocking joints called sutures. The suture joints are characterized by a saw-toothed or serrated appearance that keeps the bones attached, but allows the cranium to expand and contract while remaining intact. Suture lines are visible between the bones of the skull (Fig. 6.15). The internasal suture is between the two nasal bones while the frontonasal suture separates the frontal bones from the nasal bones. The frontoparietal suture separates the frontal bones from the parietal bones. The nasomaxillary suture separates the nasal bones from the maxillary bones. 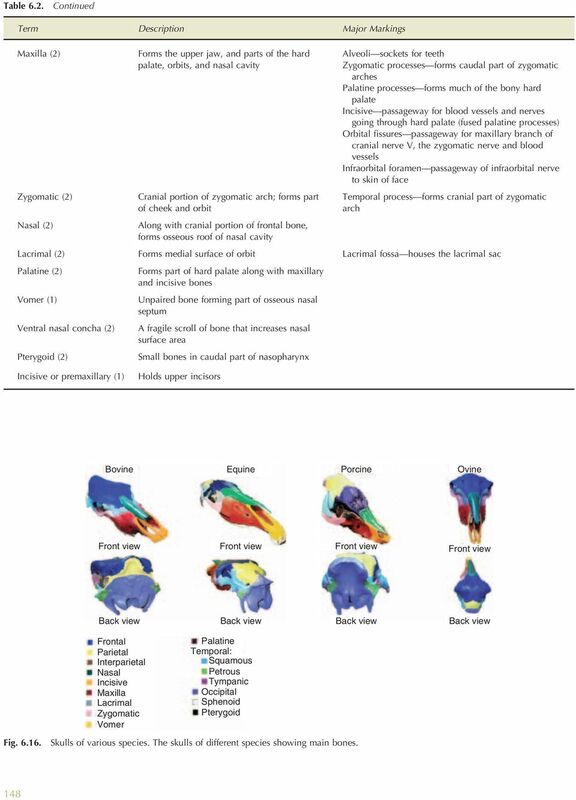 The skull contains both cranial and facial bones (Table 6.2). The cranium includes those bones that surround the brain. The cranium consists of the cranial vault, also called the calvaria, forming the superior, lateral, and posterior aspects of the skull, and the cranial base or floor that forms the inferior aspect of the cranium. The cranial base is divided by bony ridges into three distinct fossae: the anterior, middle, and posterior cranial fossa. The cranial bones form the cranial cavity that houses the brain, and also provide the site for attachment of head and neck muscles. The skull contains approximately 85 named openings, including foramina, canals, fissures, and orbits. These provide passageways for the spinal cord, blood vessels, and the 12 cranial nerves to enter and leave the brain. Cranium The roof of the cranium is formed by the paired frontal and parietal bones (Fig. 6.16). The caudal aspect of the skull is formed by the unpaired occipital bone. The floor of the cranium is formed by the unpaired sphenoid bone. 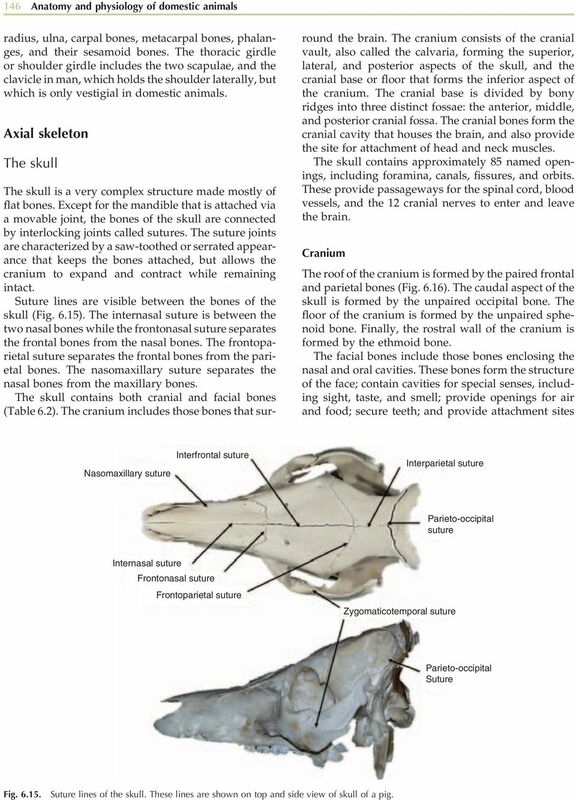 Finally, the rostral wall of the cranium is formed by the ethmoid bone. The facial bones include those bones enclosing the nasal and oral cavities. These bones form the structure of the face; contain cavities for special senses, including sight, taste, and smell; provide openings for air and food; secure teeth; and provide attachment sites Nasomaxillary suture Interfrontal suture Interparietal suture Parieto-occipital suture Internasal suture Frontonasal suture Frontoparietal suture Zygomaticotemporal suture Parieto-occipital Suture Fig Suture lines of the skull. These lines are shown on top and side view of skull of a pig. 19 Bones and skeletal system 149 A Frontal Lacrimal Nasal Maxillary Incisive Temporal Parietal Occipital Occipital condyle Zygomatic Mandible B Maxillary Nasal Incisive Frontal Temporal Parietal Occipital Fig Exploded equine skull. The various bones of the equine skull have been separated, showing side (A) and top (B) view. for facial muscles. The facial region is divided into the oral, nasal, and orbital regions. The oral region includes the incisive, maxillary, and palatine bones, as well as the mandible surrounding the oral cavity. The nasal region includes the nasal, maxillary, palatine, and incisive bones surrounding the nasal cavity. The orbital region includes the bony socket holding the eye, formed by portions of the frontal, lacrimal, palatine, sphenoid, and zygomatic bones. The zygomatic arch, which forms the ventral wall of the orbit, consists of the zygomatic bone and the zygomatic process of the temporal bones. An exploded view of the equine skull is shown in Figure Species differences Unique to the horse and cat, the interparietal bone is found between the two parietal bones. In other species, this bone is present in the fetus, but fuses with surrounding bones during gestation. In the ox, the frontal bone forms the entire roof of the cranium, whereas the parietal bones help form the roof in other species. 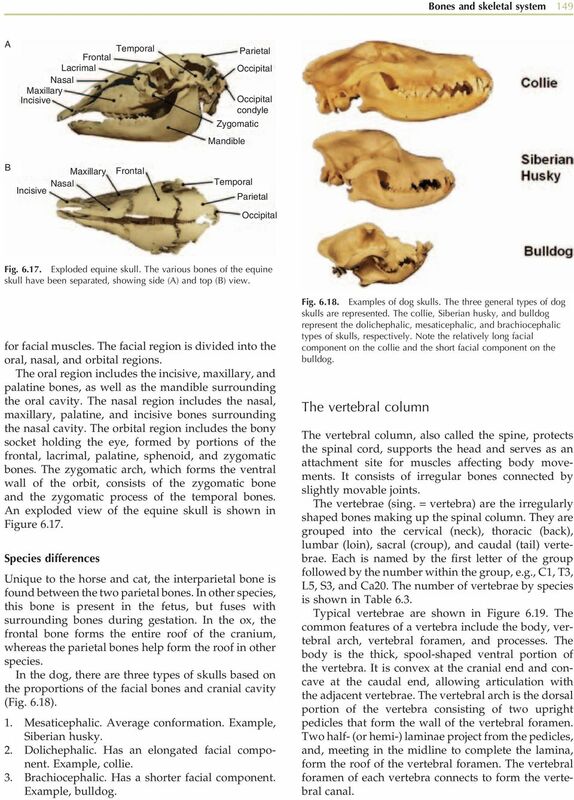 In the dog, there are three types of skulls based on the proportions of the facial bones and cranial cavity (Fig. 6.18). 1. Mesaticephalic. Average conformation. Example, Siberian husky. 2. Dolichephalic. Has an elongated facial component. Example, collie. 3. Brachiocephalic. Has a shorter facial component. Example, bulldog. Fig Examples of dog skulls. The three general types of dog skulls are represented. The collie, Siberian husky, and bulldog represent the dolichephalic, mesaticephalic, and brachiocephalic types of skulls, respectively. Note the relatively long facial component on the collie and the short facial component on the bulldog. The vertebral column The vertebral column, also called the spine, protects the spinal cord, supports the head and serves as an attachment site for muscles affecting body movements. It consists of irregular bones connected by slightly movable joints. The vertebrae (sing. = vertebra) are the irregularly shaped bones making up the spinal column. They are grouped into the cervical (neck), thoracic (back), lumbar (loin), sacral (croup), and caudal (tail) vertebrae. Each is named by the first letter of the group followed by the number within the group, e.g., C1, T3, L5, S3, and Ca20. The number of vertebrae by species is shown in Table 6.3. Typical vertebrae are shown in Figure The common features of a vertebra include the body, vertebral arch, vertebral foramen, and processes. The body is the thick, spool-shaped ventral portion of the vertebra. It is convex at the cranial end and concave at the caudal end, allowing articulation with the adjacent vertebrae. The vertebral arch is the dorsal portion of the vertebra consisting of two upright pedicles that form the wall of the vertebral foramen. Two half- (or hemi-) laminae project from the pedicles, and, meeting in the midline to complete the lamina, form the roof of the vertebral foramen. The vertebral foramen of each vertebra connects to form the vertebral canal. 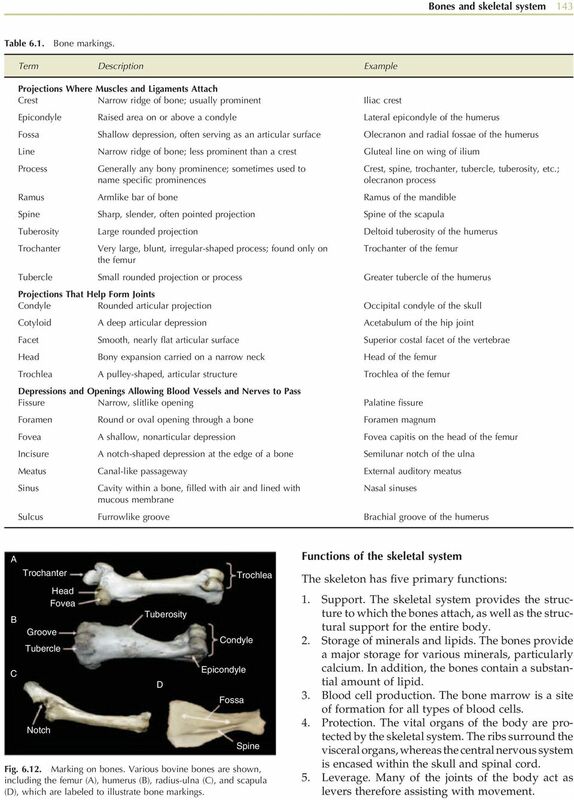 20 150 Anatomy and physiology of domestic animals Table 6.3. Number of vertebrae. Species Cervical Thoracic Lumbar Sacral Caudal Carnivore C7 T13 L7 S3 Ca20 24 Pig C7 T11 15 L6 7 S4 Ca20 23 Horse C7 T18 L6 S5 Ca15 21 Ox C7 T13 L6 S5 Ca18 20 Sheep C7 T13 L6 7 S4 Ca16 18 Chicken C7 T7 L14 (lumbarsacral) Spinous process Lamina Pedicle Vertebral arch Vertebral foramen Cranial articular process Transverse process Body Ventral tubercle Facet for tubercle of the rib Facet for rib head Cervical vertebra Thoracic vertebra Spinous process Cranial articular process Wing Transverse process Vertebral foramen Body Lumbar vertebra Sacral vertebra Fig Examples of various vertebrae. 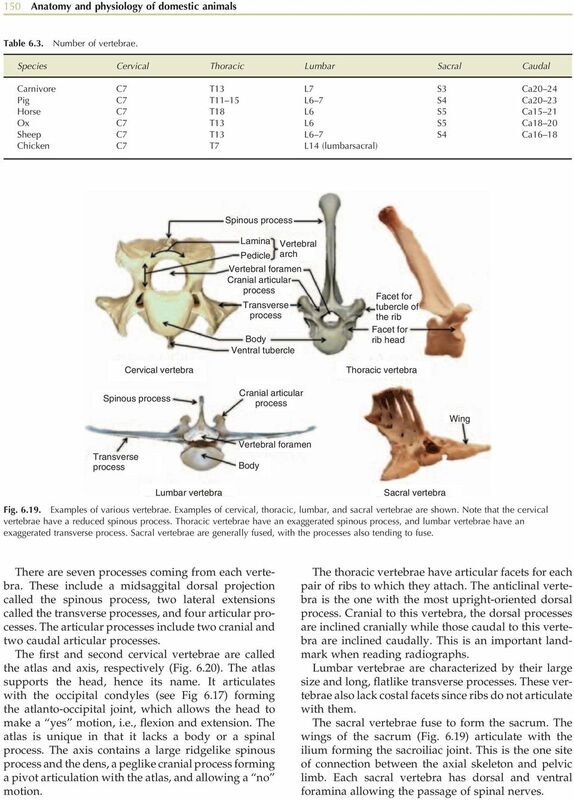 Examples of cervical, thoracic, lumbar, and sacral vertebrae are shown. Note that the cervical vertebrae have a reduced spinous process. Thoracic vertebrae have an exaggerated spinous process, and lumbar vertebrae have an exaggerated transverse process. Sacral vertebrae are generally fused, with the processes also tending to fuse. There are seven processes coming from each vertebra. These include a midsaggital dorsal projection called the spinous process, two lateral extensions called the transverse processes, and four articular processes. The articular processes include two cranial and two caudal articular processes. The first and second cervical vertebrae are called the atlas and axis, respectively (Fig. 6.20). The atlas supports the head, hence its name. It articulates with the occipital condyles (see Fig 6.17) forming the atlanto-occipital joint, which allows the head to make a yes motion, i.e., flexion and extension. The atlas is unique in that it lacks a body or a spinal process. The axis contains a large ridgelike spinous process and the dens, a peglike cranial process forming a pivot articulation with the atlas, and allowing a no motion. The thoracic vertebrae have articular facets for each pair of ribs to which they attach. The anticlinal vertebra is the one with the most upright-oriented dorsal process. Cranial to this vertebra, the dorsal processes are inclined cranially while those caudal to this vertebra are inclined caudally. This is an important landmark when reading radiographs. Lumbar vertebrae are characterized by their large size and long, flatlike transverse processes. These vertebrae also lack costal facets since ribs do not articulate with them. The sacral vertebrae fuse to form the sacrum. The wings of the sacrum (Fig. 6.19) articulate with the ilium forming the sacroiliac joint. This is the one site of connection between the axial skeleton and pelvic limb. Each sacral vertebra has dorsal and ventral foramina allowing the passage of spinal nerves. There are approximately 206 bones in your body and 22* of them belong to your skull. Carolina Biological Supply company 2700 York Road, Burlington, North Carolina 27215 HUMAN SKELETON 1 Survey 2, 3. 4. 5. 6. 7. 8. 9. 10. 11. 12. 13. 14. 15. 16. 17. 18. 19. 20. 21. 22. 23. 24. 25. 26. 27. There are 24 movable vertebrae in the spine; 7 in the cervical curvature, 12 in the thoracic curvature, 5 in the lumbar curvature.